A Round the World ticket (RTW ticket) is a special kind of airfare that can take you around the world using different airlines. RTW tickets are offered by the global airline alliances and also some specific airline partnerships. This guide provides a detailed overview of Round-the-World airfares and discusses alternatives such as flying around the world using long-haul budget airlines. Let’s jump straight in to our essential RTW ticket guide. A RTW ticket is a special kind of airfare that is literally a circumnavigation of the world using a number of different airlines. With up to 16 possible flight segments, a RTW ticket is valid for 1 year after the first departure and must start and finish in the same country. It must follow either an easterly or westerly global direction of travel. This is quite a normal Europe-Asia-Oceania-North America RTW routing with 12 segments. In fact this was the first round-the-world flight itinerary we ever flew on – way back in the mid-1990s and well before the 3 main airline alliances were formed. In those days you got paper issued tickets and up to 24 segment coupons were possible! An economy RTW ticket will generally cost between $2,500-$6,000. A premium economy RTW ticket (where available) will roughly cost between $3,500-$7,500. A business class RTW ticket will cost $5,000-$14,000. A first class RTW ticket costs $8,000-$20,000. Round the world ticket prices can vary significantly depending on the routing and the departure country. RTW tickets are bookable up to 12 months in advance and are in standard e-ticket format. The benefit of RTW tickets is that they are a convenient package that allow you to visit many cities. This can include some of the more obscure places which would otherwise be expensive to reach on a single trip. How about Chile’s Easter Island, Rarotonga, Vladivostok, Reunion Island or Svaalbard, to name but a few? A well planned 16 segment RTW trip could save you 25-40% compared with buying standard point-to-point tickets. A Round the World ticket must begin and end in the same country though not necessarily the same city in the case of larger countries. As examples, from the US you could start a RTW route from Boston and end it in Seattle; from Australia you could originate from Sydney and end in Brisbane, Melbourne etc. As mentioned, you must follow either an easterly or westerly global direction of travel. Did you know that flying times will actually be quicker if travelling in an easterly direction due to the presence of the jet stream – about 6 hours faster globally than going westerly! On a RTW ticket you are permitted to cross each traffic conference once only; in addition, you can only cross the Atlantic and Pacific oceans once each. However, backtracking within a single TC zone is permitted. Most RTW ticket tariffs are based on total permitted mileage bands – from 26,000 to 39,000 miles. As a guideline, the circumference of the Earth at the equator is 24,900 miles. A standard alliance RTW ticket allows 16 flight segments – thus up to 15 stopovers can be made between your origin and final destination city. In airfare terms, a stopover is regarded as staying at a destination 24 hours or more. The minimum amount of stopovers on a RTW ticket is 3. A segment is actually a flight or flights between 2 cities under a single flight number. So Amsterdam-Kuala Lumpur-Jakarta with KLM (KL809) is a single segment despite the stop in Kuala Lumpur. AMS-KUL-CGK is 1 segment but 2 sectors (2 take-offs and landing). RTW tickets do allow you to include a maximum of 5 surface sectors. For instance one could fly into Bangkok (BKK) with the next flight being out of Singapore (SIN). In this case the trip BKK-SIN is taken independently of the RTW ticket, either overland or on another airline ticket. Note that a surface sector is still regarded as 1 flight segment and BKK-SIN mileage would also be added to the RTW ticket’s permitted total. Watch out if flying in and out of a large city’s different airports as that would cost you a segment. For example, if you fly into London Gatwick and then leave out of London Heathrow, then Gatwick-Heathrow would be counted as 1 segment to be taken off your maximum allowable 16 segments. A Belgian student once flew on a Round-The-World ticket with a total of 106 flight coupons (hand written) travelling to 104 different cities in 50 countries! RTW tickets are flexible in the sense that you can freely change the dates of your flights, subject to seat availability. Changing the routing on an alliance RTW would incur an extra charge of $125 plus any adjustment of taxes. It is possible to have open segments on a RTW ticket which means that you do not yet have a date or confirmed seat for a specific segment. This may be less time consuming than booking everything in advance and then having to change the dates on multiple flight segments. Children’s Round the World Tickets: Generally an infant under 2 who does not need a seat would pay 10% of the RTW fare; children 2-11 with a seat pay 75% of the RTW fare – although Star Alliance does not offers this discount on business and first class tickets. Standard RTW tickets are offered from the global airline alliances Oneworld, Star Alliance and Skyteam. When considering a RTW ticket from an alliance take a good look at their route network as there may be some regions which are not as well covered. Oneworld lacks a comprehensive route network in Africa but is very strong in Europe, North/South America and Australia. Star Alliance is relatively weak in South America, the Middle East, Australia, Indonesia and Russia. It has extensive coverage of Europe, North America, Africa and Asia. 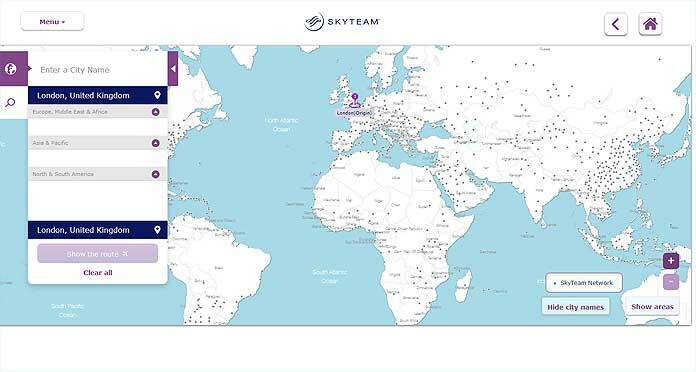 Skyteam lacks coverage in Australia/New Zealand and South America but has a good network in Europe, North America, Middle East and Asia. It has the best alliance network in China. Alliance RTW tickets include the following checked baggage allowance. Economy class has 1 piece (20kg), business class 2 pieces (total 30kg) and first class 2 pieces (total 40kg). Oneworld offers 2 types of round-the-world tickets based on either continents visited or maximum mileage. The oneworld Explorer (ONE) ticket is based on number of continents visited (3, 4, 5 or 6) with no maximum mileage in either economy class (L), business class (D) or first class (A). In terms of notation, an economy class oneworld Explorer ticket covering 4 continents would be a “LONE4″. A business class 5 continent ticket would be a “DONE5″ and so on. You can fly on 16 segments with a maximum of 4 segments in each continent (exception: 6 in North America). You can only stop twice in your continent of origin. Travel is permitted on the following oneworld airlines and some limited partner/affiliate airlines: American Airlines (AA), British Airways (BA), Cathay Pacific (CX), Finnair (AY), Iberia (IB), Japan Airlines (JL), LATAM (JJ), Malaysia Airlines (MH), Qantas (QF), Qatar Airways (QR), Royal Jordanian (RJ), S7 Airlines (S7) and SriLankan Airlines (UL). The Oneworld Explorer is often the RTW ticket of choice from air travel pros due to the lack of mileage limitations. The ticket is valid from 10 days to 12 months. The Global Explorer ticket allows travel on some other selected oneworld partners including Aer Lingus, Alaska Airlines, Bangkok Airways, Fiji Airways, Jetstar, Meridiana and WestJet. Premium economy flights on Oneworld RTW tickets are available for a surcharge (per sector) on the following airlines where available: American Airlines, British Airways, Cathay Pacific, Iberia, Japan Airlines and Qantas. Oneworld’s online booking tool is here. Tip: If you have an itinerary already in mind then just enter the airport codes like this: “LON HKG SYD SFO LON” to quickly complete your map route. Star Alliance offers 3 mileage based Round-The-World tickets – with a maximum of 29,000 miles (RWSTAR1), 34,000 miles (RWSTAR2) and 39,000 miles (RWSTAR3). These are available in economy, premium economy, business class and first class. Star Alliance also offers a cheaper 26,000 miles RTW special fare for economy (5 stops) and business class (15 stops). Travel is permitted on the following Star Alliance airlines: Adria Airways (JP), Aegean Airlines (A3), Air Canada (AC), Air China (CA), Air India (AI), Air New Zealand (NZ), ANA (NH), Asiana Airlines (OZ), Austrian Airlines (OS), Avianca (AV), Brussels Airlines (SN), Copa Airlines (CM), Croatia Airlines (OU), Egyptair (MS), Ethiopian Airlines (ET), EVA Air (BR), LOT Polish Airlines (LO), Lufthansa (LH), Scandinavian Airlines (SK), Shenzhen Airlines (ZH), Singapore Airlines (SQ), South African Airways (SA), SWISS (LX), TAP Portugal (TP), Thai (TG), Turkish Airlines (TK) and United Airlines (UA). 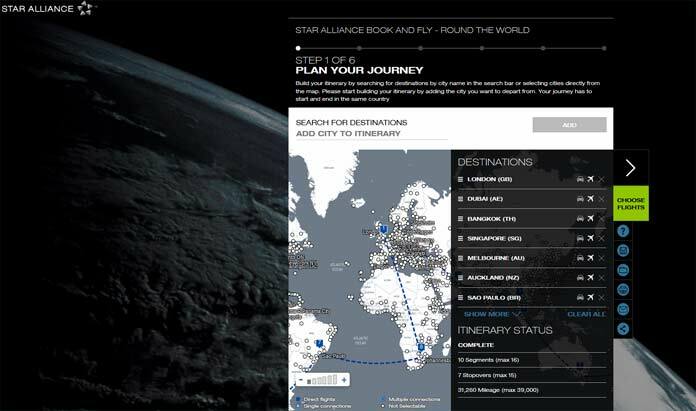 You can go here to use the Star Alliance RTW Book and Fly tool which will give price quotations for Star Alliance Round-the-World tickets. Similarly, Skyteam alliance offers 4 mileage based Round-The-World airfares in economy, business and first class. These have maximum mileage of 26,000 miles (RTWSKY 4), 29,000 miles (RTWSKY 3), 33,000 miles (RTWSKY 2) and 38,000 miles (RTWSKY 1). 3-15 stops are allowed on Skyteam RTW tickets with a validity of 10 days to 12 months. These are available for travel on Skyteam carriers: Aeroflot (SU), Aerolineas Argentinas (AR), Aeromexico (AM), Air France (AF), Air Europa (UX), Alitalia (AZ), China Airlines (CI), China Eastern (MU), China Southern (CZ), CSA Czech Airlines (OK), Delta (DL), Garuda Indonesia (GA), Kenya Airways (KQ), KLM (KL), Korean Air (KE), MEA (ME), Saudia (SV), Tarom (RO), Vietnam Airlines (VN) and Xiamen Air (MF). A number of airlines market their own RTW tickets in conjunction with selected partners. These tend to be cheaper and are simpler products than the main alliance RTW offerings. Prices start from about $1,600 in economy. The Great Escapade – This is a UK-based RTW airfare from Air New Zealand, Singapore Airlines, Silk Air and Virgin Atlantic. The maximum permitted mileage is 29,000 miles although up to 4,500 miles can be added on at a rate of £130 per 1,500 miles. This fare has unlimited stops and is good for UK-Asia-Oceania-North America-UK. Prices depend on the route and start from about £1,300 in economy class; fares also available in premium economy and business class. Virgin Australia offers a RTW fare from Australia in conjunction with Virgin Atlantic. You can fly around-the-world on these 2 airlines alone: Virgin Atlantic between Los Angeles-London-Hong Kong and Virgin Australia on Hong Kong-Melbourne-Los Angeles. There are other possible ticket combinations which also include Qantas and Cathay Pacific flights. Emirates offers a limited RTW routing from France only in partnership with Air Tahiti Nui. In the past it was possible to go around-the-world on a single airline. The first to do so was Pan Am in 1947. It flew San Francisco-Honolulu-Hong Kong-Bangkok-Delhi-Beirut-Istanbul-Frankfurt-London-New York in both directions using Lockheed Constellation propeller aircraft. The ticket was valid for 180 days meaning you could stop off anywhere along the route. Total flying time was around 48 hours and the ticket cost $2,300 (1947 dollars) or around $26,000 in today’s money. The last airline to operate RTW flights entirely was Air New Zealand which flew London-Hong Kong-Auckland-Los Angeles-London. However the London-Hong Kong flight was discontinued in 2013. The alliance RTW tickets do not cover travel on no frills budget airlines. The likes of Easyjet and Ryanair, Air Asia, Tigerair and Southwest all have excellent regional networks. We are seeing the advent of long-haul budget airlines which can connect the regions offering cut-price travel. This gives the opportunity to construct an independent RTW ticket with a mix of airlines. In theory it should be possible to put together a budget RTW ticket for little over $1,000 base fare although there are still some limitations on trans-Pacific flights. Also remember the budget airline fares do not include checked luggage – which could be important on a RTW trip where you may be hitting a variety of different climates – and this could add to the base cost significantly. For those who don’t want to have the RTW ticket restrictions of 16 stops and 12 months, putting your own trip together using independent airlines might be a good option. Especially gap year travellers who are flexible and want to create their itinerary as they go. Obviously you won’t earn any alliance frequent flyer miles if you go the budget route. Norwegian – Flies on trans-Atlantic routes from Barcelona, Copenhagen, London Gatwick, Oslo and Stockholm to various US destinations including Boston, Fort Lauderdale, Los Angeles, New York, Oakland and Orlando. It also flies London Gatwick to Buenos Aires and Singapore. It uses Boeing 787 aircraft and fares start at $200 one way. LEVEL – This relatively new low-cost airline from International Airline Group (IAG) operates trans-Atlantic flights from its Barcelona base. Responding to the competition from Norwegian, it flies to Los Angeles, Oakland and Buenos Aires and one-way prices start at $200. Scoot – The Singapore-based budget airline has a good network covering south-east Asia and Australia. It also has a Singapore-Athens flight from €180 which also uses a Boeing 787. Air Asia X – The medium-haul arm of budget heavyweight Air Asia flies Kuala Lumpur-Honolulu via Osaka using an Airbus A330. 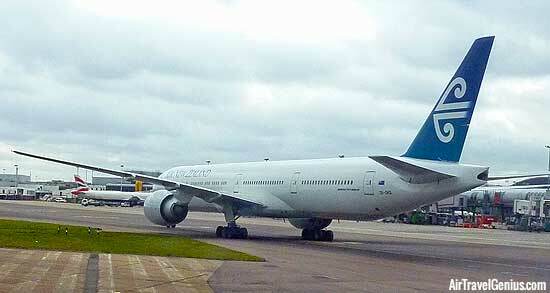 It is also considering reinstating its Kuala Lumpur-London Gatwick flight as well as further routes to Europe. Jetstar – The Qantas low-cost subsidiary has an extensive network around Australia and Asia. It also flies from Sydney and Melbourne to Honolulu with fares from $225 one-way. It is actually possible to fly with Jetstar on Oneworld Round the World tickets. 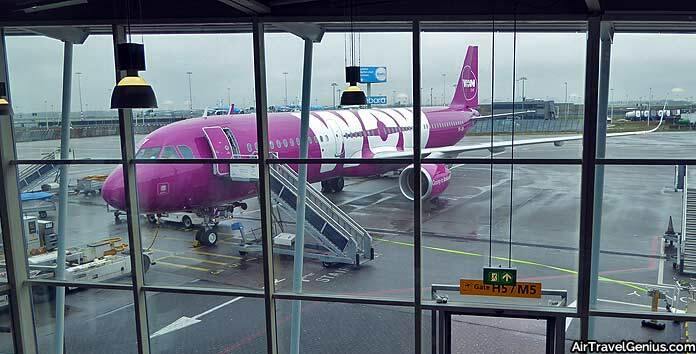 WOW Air – An Icelandic budget carrier which links the US and Europe via its base in Reykjavik. Now, we are not necessarily recommending you go out and book a budget RTW. The extra charges will certainly add up and each booking will be separate. That said, some of the above budget airlines have very reasonable premium seat products. These could be a budget alternative to buying a standard business class RTW ticket. For those on a standard alliance RTW ticket, budget airlines can still be useful for taking cheap side trips whilst on your journey. An interesting tool for putting together an independent RTW or multi-stop air ticket is Indie from US based agent Bootsnall. It can give you an immediate bookable quote for up to 18 stops (no mileage limits) and uses both standard and budget airlines. We have no connection with any of the above agents. It is always worth getting multiple quotations for your RTW ticket from specialist agents/brokers as well as the airlines and alliances. Generally you extract get better value from the alliances if making at least 10 stops. For those needing shorter round-the-world ticket itineraries (say 5-7 stops), an agent may be able to quote a cheaper ticket price than an alliance – particularly in business class. Cheaper Airfare Countries – As with cheap business class tickets, you will save a significant amount of money (especially in business or first class) by buying and starting a RTW trip from one of the cheaper airfare countries – this includes Sri Lanka, Egypt, Mozambique and South Africa. Although you may sometimes have to find a local travel agent to ticket the fare and also need to factor in a positioning flight to that particular starting city. For example, let’s take a simple OneWorld Explorer RTW route in business class London-Los Angeles-Sydney-Bangkok-Hong Kong-Doha-Johannesburg-London. The price (US dollars) varies depending on which is our starting city. At the time of writing, the oneworld Explorer price from Los Angeles is $13,200; from Sydney $11,100; from London $10,700; and from Johannesburg $9,100. Simply by starting from Johannesburg instead of Los Angeles in this case, you could save $4,100. The reason for the UK and South Africa being cheaper is the recent relative weakness of the pound sterling and rand. Prices have be as low as $5,000-$7,000 in some markets although airlines eventually raise prices if too many tickets are being sold to non-residents. It is also worth calculating the price per segment for your RTW ticket. Anything under $400 per segment for business class is very good value. With 30 to 80 hours of flying time on a round-the-world ticket – depending on route and segments – maximising your business class experience can make your journey a lot more comfortable. Not only on board with flat seats and premium catering but also on the ground with dedicated check-in, fast-lane security and airport lounge access options. In November 1986 a British Airways Concorde aircraft flew around the world in 29 hours and 59 minutes! It covered 28,238 miles. Taxes and Surcharges – The first airline on the RTW itinerary will normally “issue” the ticket and calculate the taxes and fuel surcharges. RTW ticket fare calculations can be complex and there may be significant differences in taxes and charges between airlines – these can run anything up to about $2,200. Before booking, experiment by changing the airline of your first flight to see if the surcharges can be reduced. That said it is worthwhile getting your RTW ticket issued by a major airline (such as British Airways or American Airlines) as making changes will probably be easier. Airport taxes vary significantly so be flexible with your route and research alternative transport options as well – whether low cost airlines or high speed trains – and consider your surface sector options. With some of the highest air passenger taxes in the world, London UK may be one stopover to avoid. Frequent Flyer Elite Status/Air Miles – If you are planning to fly on an alliance Round-The-World ticket then you definitely should be a member of one of the airline frequent flyer programs in the alliance. Now flying on a paid business class RTW ticket from a cheaper country is an excellent way of accelerating yourself to top tier elite status in a frequent flyer program. Do watch the timing of the trip in terms of your membership year – whether you want to credit all the status miles over a single year or perhaps over 2 membership years. Some flyers will try to max out the number of possible segments (16) and fly on the longest possible flights to get as many frequent flyer miles as possible – particularly on a Oneworld Explorer ticket which has no mileage limitations. You often have the choice of flying under a codeshare number rather than operating airline which can also make a difference to the award miles credited (depending on your airline program rules). Lastly, never skip a flight on a RTW ticket as you risk your entire itinerary being cancelled. Always inform the airline in advance if you need to change the flight date. Cabin Limitations – Be aware if buying a first class or premium economy class RTW ticket – many airlines/routes do not have these cabins available. First class seats tend to only be available on major routes. Star Alliance carriers with a premium economy cabin are Air Canada, Air China, Air New Zealand, ANA, EVA Air, Lufthansa, LOT Polish Airlines, SAS, Singapore Airlines, THAI and Turkish Airlines. Nested RTW Tickets – If you do a significant amount of travelling it is possible to run more than one RTW ticket at the same time. Flyers with nested RTW tickets generally use the tickets to travel between their homebase and their favoured (cheaper) starting points. Qantas (Oneworld) charges 140,000 (economy), 210,000 (premium economy), 280,000 (business) or 420,000 (first class) for a Round-the-World ticket up to 35,000 miles, 16 segments and 5 stopovers. A RTW ticket (Star Alliance) using Lufthansa Miles&More points will cost 180,000 (economy), 325,000 (business) and 480,000 (first class) before applicable taxes and surcharges. Skyteam’s Korean Air charges 140,000 miles (economy) and 220,000 miles (business) for a Round-the-World ticket. Often you can extract more value from an award chart by booking 2 or 3 long-haul one-way flights with stopovers and effectively creating your own RTW ticket. We would probably recommend booking business class rather than economy class on rewards as it is priced at 1.5-2x points (compared with the standard 3.6x average business:economy airfare ratio). And as we are talking about a significant chunk of miles/points needed for RTW tickets, don’t forget that airlines can always devalue their award charts at any given moment! A Round-The-World (RTW) ticket is a special airfare for circumnavigating the globe with up to 16 segments (15 stopovers) and valid for 12 months. Travel starts and ends in the same country and follows either an easterly or westerly direction. Up to 5 surface (overland) sectors can be included. RTW tickets are offered by the main global alliances – Oneworld, Star Alliance and Skyteam. Simpler RTW tickets can be offered by various airline partnerships. Tickets are normally mileage based (26,000-39,000 miles) or continent based and are issued by the first airline flown. Dates can be changed for free, route changes cost around $125. You can only cross the Atlantic and Pacific ocean once but can backtrack within a continent. Economy RTW tickets cost $2,500-$6,000 although more basic tickets can be cheaper. Premium economy RTW tickets (where available) cost roughly $3,500-$7,500. Business RTW tickets cost $5,000-$14,000 – mainly depending on the starting country and the strength/weakness of the local currency. Cheaper countries to start a RTW ticket include Sri Lanka, Egypt, Mozambique and South Africa. First class RTW tickets cost $8,000-$20,000 but ensure first class cabins are available on your proposed flight routes. Taxes and surcharges can cost up to $2,200 on a RTW ticket. RTW tickets can help you get top-tier elite status in a frequent flyer program and a significant amount of air miles/points, especially by maximising your route options. Get a quote from a RTW-specialist agent as they can sometimes be cheaper than an alliance fare, particularly for trips with less stops. It is possible to fly around-the-world using a mix of budget airlines which would can cost $1,000-$2,000, but watch for extra charges. Last updated 17 Sep 2018.